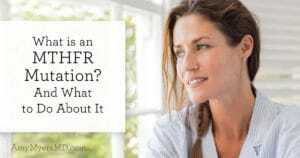 In my last article I talked about what MTHFR mutations are, why they matter, and how they’re connected to autoimmune disease, Hashimoto’s, Graves, and thyroid dysfunction. If you’re just joining me, be sure to check out the first article and then pop back over here. 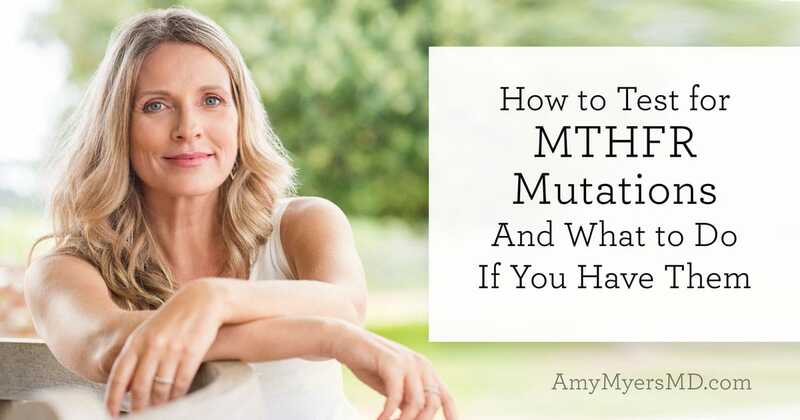 In this article, we’ll be diving right into how to test for MTHFR mutations (now that you understand the significance) and most importantly, what you can do to help to minimize the health impact if you have any MTHFR mutations. How To Test for MTHFR Mutations? I strongly recommend that everyone get tested for MTHFR mutations, especially if you are a woman of childbearing age, as MTHFR has been found to increase the risk of miscarriage and birth defects, including Spina Bifida, or if you have a history of Hashimoto’s, Graves’ or any other autoimmune disease, since MTHFR contributes to those conditions. I also encourage my patients who have newborns or young children to test for MTHFR as well. Determining which vaccines your child receives and at what schedule is a personal choice, and knowing your child’s MTHFR status, and what impact the vaccines might have on their health, is an important part of that choice. Being a new mother myself, testing Elle for MTHFR was high on my priority list. Here’s a quick theoretical illustration of how MTHFR mutations affect your ability to detoxify, as a reminder for why it’s so important to know your MTHFR status. (For an in-depth explanation, check out my first article on this topic). Lab testing to check for MTHFR mutations used to be costly, require a prescription and a blood sample, however, these days genetic testing is much more affordable, accessible and convenient. You may have heard of the test from 23andMe which can be ordered online for $199. Many of my patients and our wellness coaching clients have tested their MTHFR status using 23andMe’s service. The positives to 23andme are that is does not require a physician prescriptions and it test for hundreds of SNPs. The cons are that the results come in a raw data format which is impossible to understand so you must then input your results into another tool or service, such as MTHFR Support to get a readout that is easy to understand of your MTHFR status, along with the other SNPs they test for. In addition, 23andme does require a saliva sample which is nearly impossible to do on a baby, so if you are looking to know your child’s MTHFR status before vaccinating then this won’t work for you. I recently discovered a new company called dnalife® that offers genetic SNP testing with just a mouth swab instead of saliva (which is much easier for babies and it is what I used for Elle). The test checks for fewer SNPs than 23andme, however it does deliver all of the data in a format that you or your doctor can easily read and understand. The downside is that typically need a functional medicine physician to order it for you. However, as a favor to me dnalife® agreed to let you order your own MTHFR test here without a doctor’s order. If you want additional SNPs then you will need to ask your functional medicine doctor to order that for you and I would recommend getting the dnahealth profile (which is what I did for Elle). You of course can always ask your primary care physician to order a MTHFR blood test for you. I have found however, that most insurance companies do not cover this and you could be left with a $800-$1,000 bill. Another (less definitive) way to evaluate MTHFR status is to have your doctor run an homocysteine level for you. It is a much less expensive option and I find more typically covered by insurance. As I mentioned earlier, the methylation process converts homocysteine into methionine. If you have one or more MTHFR mutations and your ability to methylate is reduced, your body won’t be able to convert as much of it, and you will typically have high levels of homocysteine in your blood (a high homocysteine typically means undermethylation however, a low homocysteine can indicate either over or under methylation). High homocysteine levels can negatively impact mental health and mood, and has been linked to cardiovascular disease, high blood pressure, the inability to detoxify (especially heavy metals), certain types of cancer and blood vessel damage. If someone’s homocysteine level is elevated – above 10 umol/L, that tells me right away there is one mutation. If it’s as high as 18 umol/L, then that tells me there are likely two mutations. On the flip side of that, too low of a homocysteine level such as 2 – 4 umol/L can indicate that you are not methylating or you are over methylating, which can be just as problematic. An optimal homocysteine level is 6-9 umol/L. OK, so you’ve discovered you have one or more MTHFR mutations. And you might be feeling as though your genes control your destiny and that it looks pretty bleak. I get it, trust me, I do! Remember, I have two mutations at C677T and my ability to methylate based on my genes was cut down to 10%, it’s likely one of the reasons I got Graves’. But the truth is that by following the same simple steps that I have used personally and that I recommend my patients to follow – you too will be able to hack your genes and work around them and get your body methylating in an optimal range in no time. So, what did I do and what do I continue to do everyday to keep myself methylating optimally? 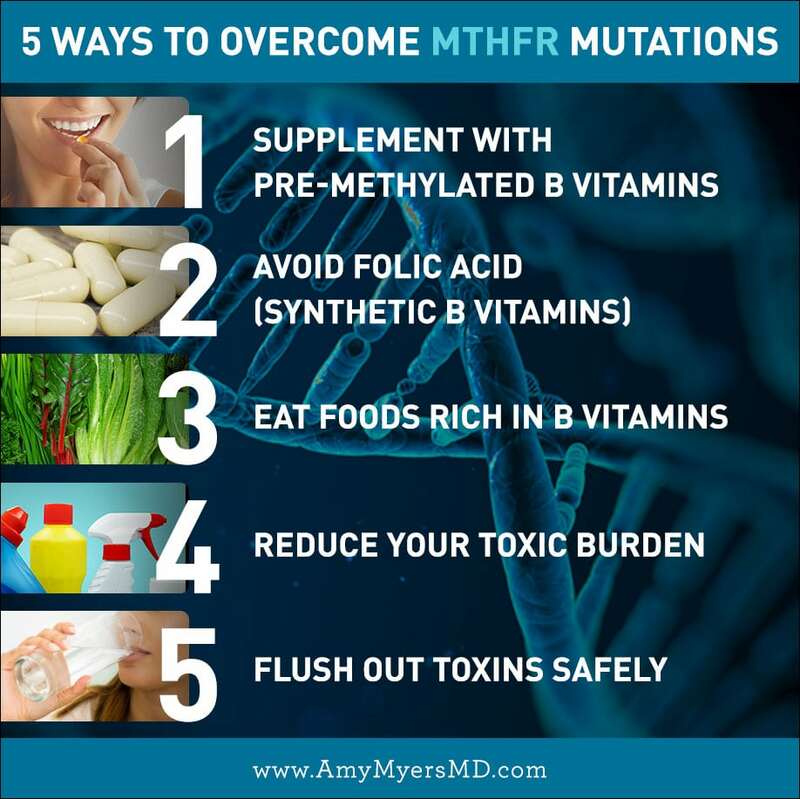 Since MTHFR mutations reduce your ability to methylate, one of the best things you can do is to supplement with the three main co-factors needed for methylation. These are folate (a naturally occurring B vitamin) in its pre-methylated form, which is 5MTHF, B6 in its active form, and B12 in its active form. I take a supplement called Methylation Support™ everyday without fail. It contains all three of these B vitamins. I recommend this supplement to all of my patients with MTHFR mutations. These pre-methylated and active forms of the B vitamins absorb well and work to increase folate levels and decrease homocysteine levels. You can find the supplement here, along with a short video where I explain how it works. If you have one or more MTHFR mutations I recommending supplementing with Methylation Support™ daily (this is what I do and will continue to do for the rest of my life). 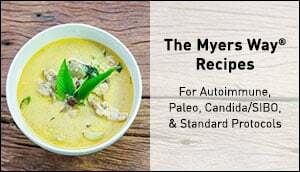 If you have been prescribed methotrexate as part of your treatment for autoimmunity, I strongly recommend supplementing with Methylation Support™ because methotrexate blocks folate pathways. In fact, if you have two mutations, even with methylation support you may want to consider a different medication. 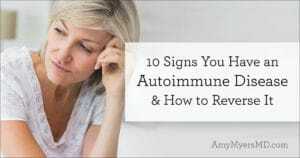 Or, ideally, check out my 6-week Autoimmune Solution Program to address the underlying causes of your condition, so you can come off of these harsh medications altogether. As a reminder, simply increasing your folic acid will not help with methylation issues since your body isn’t able to convert it. In fact, taking folic acid (which is synthetic and found in fortified and processed foods, and is the form found in most supplements) can actually be harmful because it stays in your body unconverted, attaching itself to the exact same receptors used to absorb folate, thus ‘clogging them up.’ Further, studies have also shown that taking folic acid in high dosages can cause cancer. I also recommend getting plenty of B vitamins naturally through your diet. The highest folate-rich foods include asparagus, romaine lettuce, broccoli, avocado, and dark, leafy greens such as spinach, kale and Swiss chard. Foods high in B6 (another important factor in methylation) include poultry, seafood, bananas, and leafy green vegetables. And you can add in more vitamin B12 with fish, poultry, and meat. However, if you have two mutations like me, I do not think diet alone will get you enough B vitamins to methylate optimally and I still recommend supplementing with Methylation Support™. 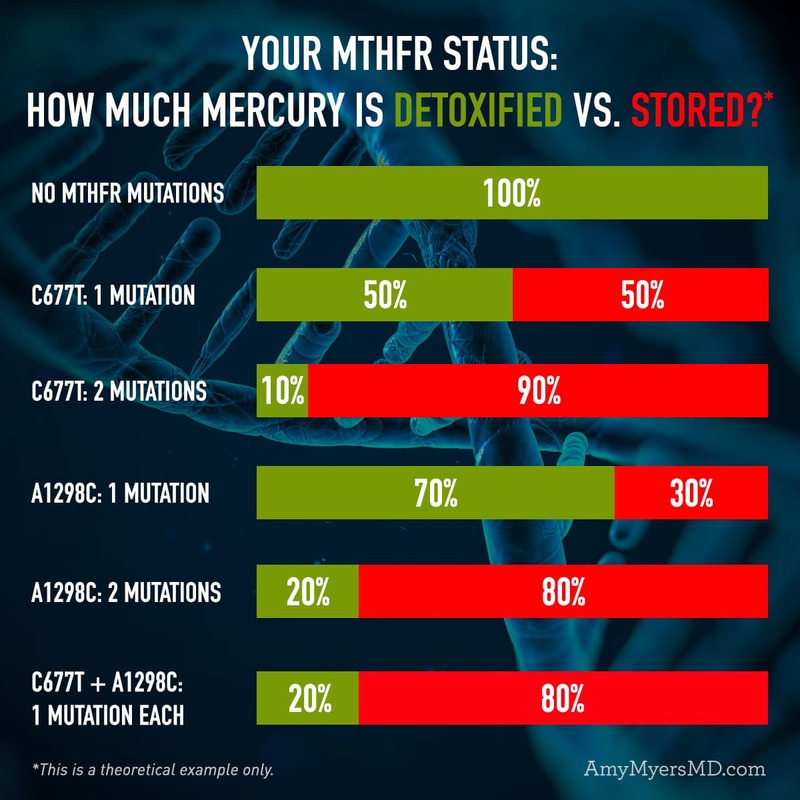 Because MTHFR mutations reduce your ability to detoxify, particularly heavy metals, you’ll want to minimize your exposure to toxins. Filter your air – Mercury can be found in the air near coal burning plants, so to avoid breathing it in, I recommend using a HEPA filter in your home and office. The Sierra Club created an interactive map that allows you to see if there are any coal-burning power plants in your area. Filter your water -Thanks to pollution and runoff, mercury can be found in our water supply. To protect your water I recommend installing water filters on all of your taps and showerheads. 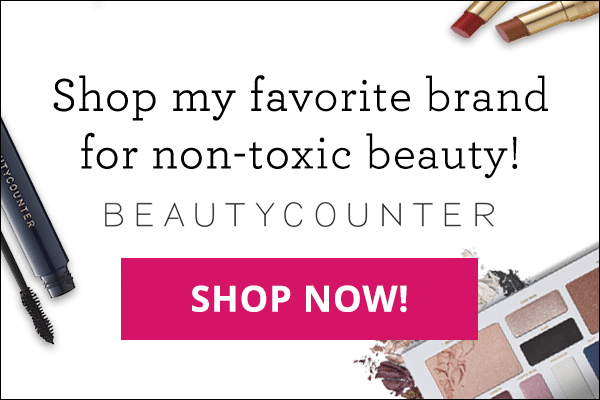 Remember, chemicals can be absorbed through the skin too! Remove amalgam fillings safely – Amalgam fillings contain mercury and emit a mercury vapor that can leach into your bloodstream. For more information on the risks of amalgam fillings and how to remove them safely, check out my podcast episode with biological dentist, Stuart Nunnally. Choose fish that are not high in mercury – The Environmental Defense fund has a list of fish that are typically high in mercury and should be avoided, and those that are low in mercury and are preferred. You can learn more about reducing your toxic burden in this post and in my books, The Autoimmune Solution and The Thyroid Connection. In addition to preventing toxins from coming into your body, you’ll also want to focus on supporting your detox pathways to flush toxins out safely. Eat cruciferous vegetables – These vegetables, including arugula, broccoli, brussel sprouts, cauliflower, and collard greens, are rich in antioxidants and support safe detoxification. Pee, poop, and sweat the toxins out – You’ll want to drink plenty of water and add in activities that help you sweat, such as exercise or using an infrared sauna. Add in Glutathione – This is your body’s most important detoxifier and it plays a big role in helping to prevent autoimmunity and cancer. However, your ability to produce it is diminished if you aren’t methylating properly. 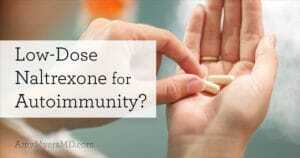 The glutathione I carry in my store is not broken down by the gut and is well absorbed. I continue to take this everyday and recommend it to all of my patients with autoimmunity and MTHFR mutations. Take a Liver Support Supplement – The one I carry in my store contains N-acetyl L-cysteine, alpha-lipoic acid, milk thistle, and selenium to support antioxidant activity and promote a healthy immune system. In addition, it helps support your body to make more glutathione. I take this everyday too. Increase Your Magnesium – Magnesium supports the detoxification process through its major role in the production of energy (as ATP), which provides cells with the energy they require for pumping out toxins before, during, and after they accumulate. 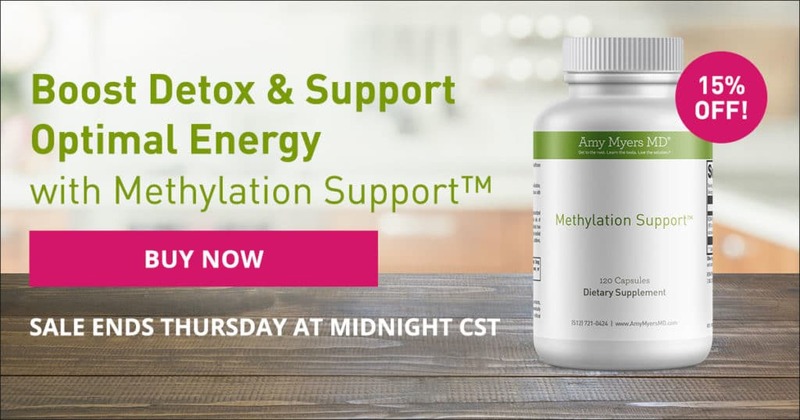 Don’t forget the Methylation Support™ – Of course, as I mentioned above you’ll want to be sure you’re taking a methylation support supplement. This and the glutathione in my store are my two absolute go to supplements that I take daily no matter what. Remember knowledge is power, so knowing your MTHFR status and understanding what it means and what you can do about it is a huge first step in taking control of your health! You may have been dealt a certain genetic hand, just remember that you have unlimited choices in how you play that hand.